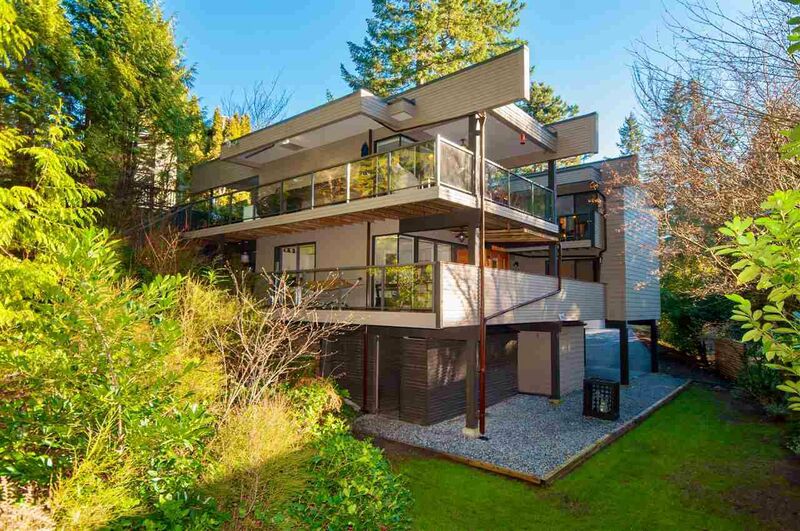 A spectacular West Coast Contemporary residence on one of North Vancouver’s most sought-after streets in tranquil Blueridge. This gorgeous home has been extensively renovated in recent years, & features 4 spacious bedrooms, 3 bathrooms, over 2,500 sq.ft. of luxurious living on two sprawling levels. Enter the main level through an open foyer to a sensational layout, perfect for entertaining, including a spacious living room with gas fireplace, renovated maple kitchen with newer appliances and separate eating area and dining area overlooking the private yard, as well as a stately master and ensuite. Lower level includes 3 guest bedrooms, full bathroom and cozy recreational area with gas fireplace. New paint and windows, tasteful updates and extended beam design blend naturally with the 9,800 sq.ft. park-like setting. Approx. 1,000 sq.ft. decks! Separate Workshop, Utility & Storage bldgs. This magnificent home has been meticulously maintained and is surrounded by lush, manicured gardens. Exquisite!